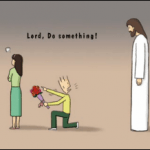 Have you heard the name Nick Vujicic? How about this phrase:”No arms, No Legs, No Worries?” Nick is one of the most inspirational Christian Speakers I’ve ever heard. His ministry, Life Without Limbs, travel around the world sharing about the love and hope in Jesus Christ. Nick is born Serbian parents, born in Australia, and now living in California, USA. 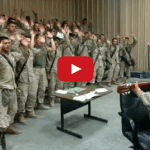 Can You Take on the Marines for Christian Praise and Worship? These 7 year old twin are simply amazing. Memorizing the lyrics alone takes a lot effort for such age. It’s awesome to see these girls starting to put their faith in Christ at a tender age and hoping that they live and understand the meaning of the song Amazing Grace. Have you ever seen a famous flash mob videos? They’re all over the net. If you have not seen one, the video below is a good starting point. In the video, Over 2,000 people from Second Baptist Church, Houston, Texas, gathered to celebrate the resurrection of Jesus. They called it Dance Your Shoes Off! and each participant left a new pair of shoes on the field for those in need. Song is a Second Baptist Church original called “Rise Up” performed by Lauren James Camey, a member of the church. It was produced by Joshua Moore.